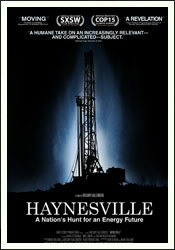 Meet members of the creative team behind Haynesville following each screening. Local filmmaker Gregory Kallenberg’s Haynesville: A Nation’s Hunt for Energy explores the momentous discovery of the largest natural gas field in the United States. Set in Northwest Louisiana, the film focuses on three lives caught in the middle of the find: A single mom takes up the defense of her community’s environmental protections, an African American preacher attempts to use the riches to build a Christian school and a self-described “country boy” weighs losing his land against an oil company’s offer to make him a millionaire. ~ by Voltima on April 23, 2010.